Delicious and healthy chicken divan. Growing up my mom always made this healthier version of Chicken Divan that cuts out things like cheese, sour cream and bread crumbs used in traditional chicken divan. I far prefer this version, and surprisingly, so does my husband! 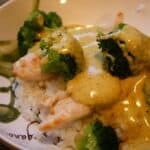 There’s so much flavor in the sauce, it’s really yummy, and this is a super easy dish for a weeknight meal. Spoon rice into 8x8 casserole dish. Layer grilled chicken tenders on top of the rice. Place the broccoli in a small saucepan with 1/4 cup of water. Blanch until bright green, 2-3 minutes. Layer broccoli on top of chicken. Make the sauce by mixing the soup, mayo or yogurt, lemon juice and curry powder. Pour sauce on top of casserole. 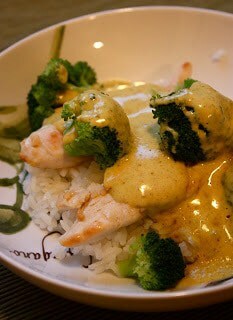 I am going to make this for dinner Sunday – and hope that it looks and tastes as good as Colleen’s. Wish me luck! Added chicken broth, otherwise it’s too dry. Also, Worcester Sauce adds some depth of flavor.